In the case of the purchaser acquiring the whole of the shares of the target company he takes on the legal personality of the company, ‘lock, stock and barrel’. He therefore acquires not only the assets but also; its actual, potential or contingent liabilities, its tax history including all claims for undeclared income, whether in respect of tax, all contractual matters and legal wrongs (called ‘torts’) committed by it in the past. With a purchase of the assets of the target company (as opposed to the purchase of its shares), this problem area does not arise. It is therefore vital, if a client is purchasing the shares of a company, that he has an accountancy ‘due diligence’ carried out by his own accountants, usually prior to us being instructed to draw up the share purchase agreement (‘SPA’). This ‘due diligence’ should be an in depth investigation designed to uncover financial problems or irregularities. The fee for this will depend on the amount of work your accountants need to do and it may be quite expensive. In consequence, we usually advise clients to instruct us to prepare and agree a Heads of Terms agreement with the solicitors acting for the Seller, so that the client knows that they are both ‘singing from the same song-sheet’. If they are not, this will save the waste of the accountant’s fees for the due diligence. When the accounting due diligence has been completed, we will usually need to do a legal due diligence before drafting the SPA. The legal due diligence will address such matters as; the legal title to and details of the target company’s land property (including for example any contamination of it, for which the target company is, or may in the future, be liable). From the perspective of legal fees, a share purchase is a potentially expensive matter. You should only embark on it after careful consideration with us, as to the relative advantages and disadvantages of both the share purchase route, and the asset purchase route. It is usually better for this initial consideration to take place prior to you embarking on the accountancy due diligence. The other means of purchasing a business is the purchase of the assets of the target business rather than the shares of the target company running the business. In this case the buyer does not acquire the target company’s legal identity, but only acquires specific assets, usually includes the goodwill of the business, its freehold or leasehold property, equipment, employees etc. However, the purchaser does not take over all of the liabilities (including tax liabilities), and any legal claims against the business for contractual liabilities or civil wrongs (torts). There is less uncertainty with an asset purchase of a business, so it is less of a risk. There is less legal work and therefore the fees are less. 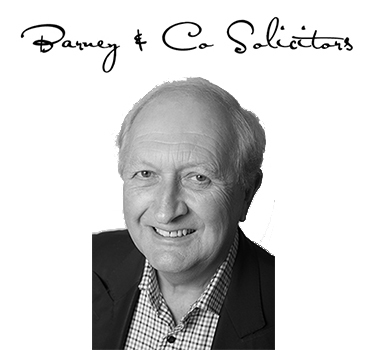 Whatever the size or nature of the sale or purchase transaction, Barney & Co. can assist.